I don’t know about you, but I’ve never seen a drunk chicken before. I will tell you this though, they sure do taste good! 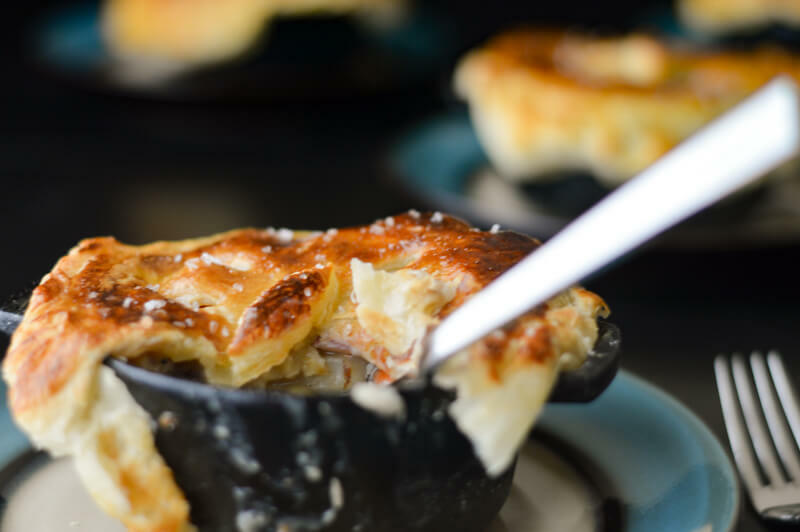 I’ve dressed up this classic pot pie with a splash of white wine and I think you’ll find it quite tasty. I do remember stories my grandma used to tell about headless chickens running around the yard before they “headed” (no pun intended) to the large kettle waiting on the stove in her kitchen. It was no small matter to prepare a chicken dinner in my Grandma’s day. I am still in awe at the time, the effort and the MESS that was involved. I will spare you the details of how the chickens lost their heads. Being the wimp that I am, I guarantee I would not have the stomach to do the things my Grandma did back on the farm. Whereas it would have been a whole day affair to get the chicken’s ready in the early 1900’s, I spent five minutes before the butcher counter yesterday and was still impatient. Can you believe I had to wait on him as he wrapped my chicken up? Oh, how times have changed. Although I will admit sometimes I would love to be able to live in a time and place where life was much simpler, more difficult maybe, but less complicated. Don’t laugh at me, but one of my old favorite TV shows is Dr. Quinn, Medicine Woman. I have a happy imaginary place where there are no devices, no phones, and no large screens in every room of the house. And then I shake myself free as I grab my phone to text a friend who lives in another part of the country. Back to the drunk chickens … Adding wine to anything gives it a feel of sophistication. Or so in my head, it seems that way. I pour in a bit of chardonnay and “voila” it’s now gourmet. 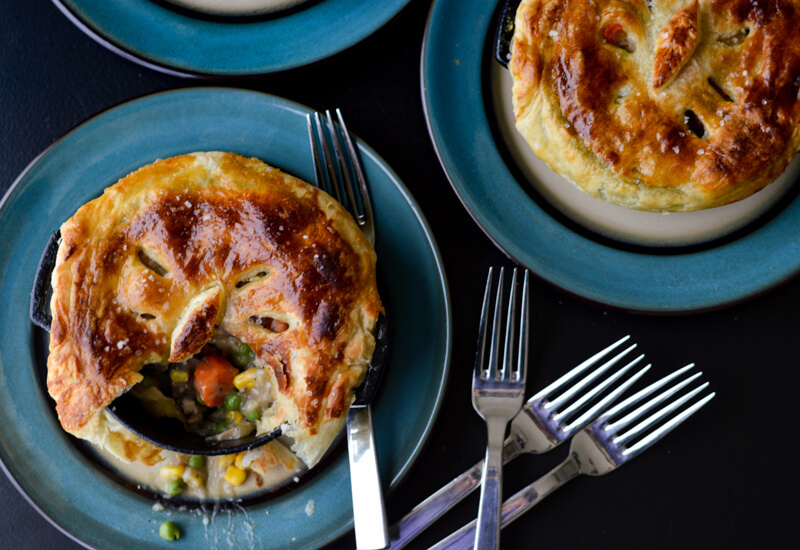 Therefore … I give you Drunken Chicken Pot Pies with a little finesse. 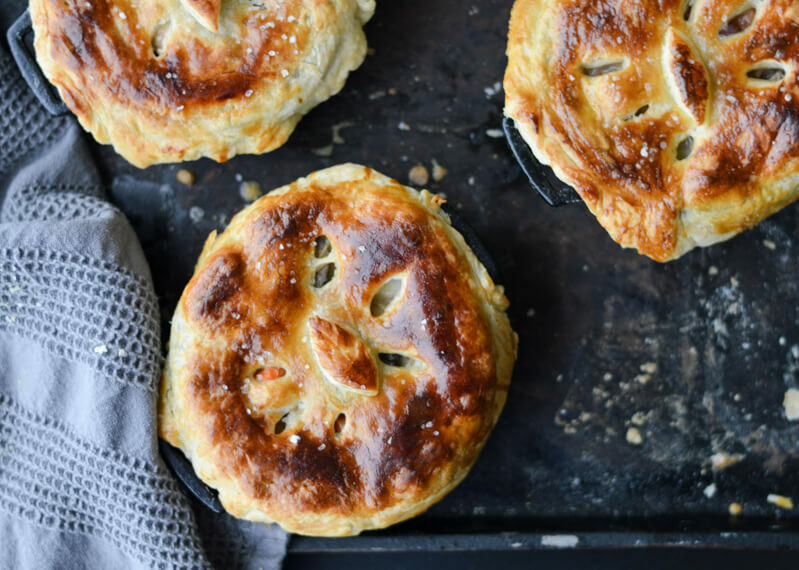 I love that you can individualize these pot pies. I found the cutest mini cast iron Dutch ovens a few weeks back and I’ve been gnawing at the bit to put them to good use. I think the two-cup capacity is the best size because it gives a good helping to whoever is eating them. They are also handy to eat in front of your big screen as you watch your favorite Netflix show in whatever room you choose. I’ve loaded this recipe with tons of veggies and, of course, big chunks of white chicken meat – it’s packed with flavor and texture galore. 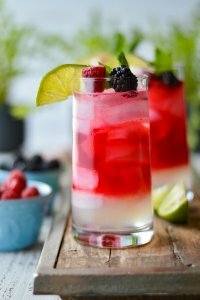 There is a hint of thyme in it as well. 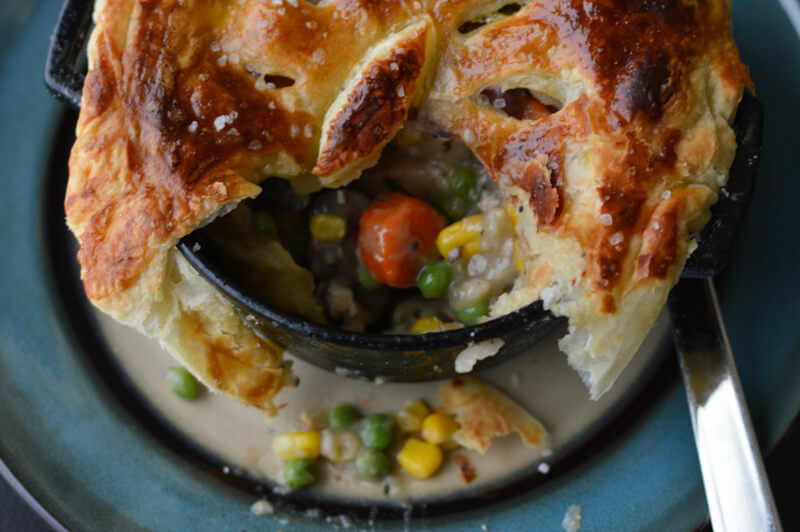 I used Puff Pastry in this Drunken Chicken Pot Pie because, first of all, I love the light and airy texture it gives. Secondly, because the sheets are so simple to use. 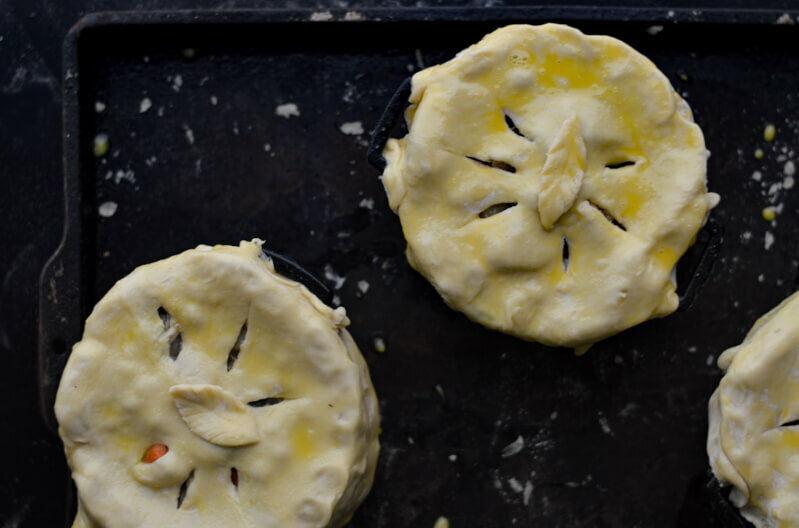 Unfold, roll a little bit, and there you have it – a perfect crust that is without effort. And sometimes, “without effort” fits precisely in my day. 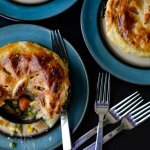 This Chicken Pot Pie is especially scrumptious with depth of flavors and texture. It is loaded with chunks of white chicken breast and tons of veggies. 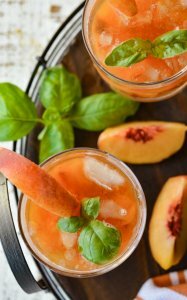 White wine and thyme are somewhat secret ingredients that bring it all together. Preheat oven to 450° F. Loosen the skin on the chicken breasts and generously salt and pepper under the skin and all over each breast. Pour the chicken stock in a Dutch oven and add the chicken breasts. Cook for 60 minutes or until an instant-read thermometer registers 165°F in the thickest part of the chicken. Times may vary depending on the size of the breasts. Remove the chicken to a plate and cover with foil. When cooled, remove the bone and cut into cubes. Strain the broth and reserve for the filling with the veggies. (This step can be done a day ahead of time). 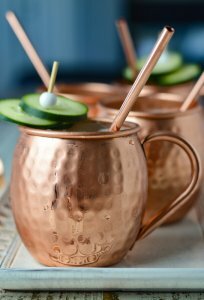 Reduce the oven temperature to 400°F. Unfold Puff Pastry and cut 4 circles that are 3 inches larger the rim of your ramekins. Gently press the circles into the bottom and sides of the ramekins. Gently crimp the edge down over the outside of the rim. It should hang down about 1 inch from the top. Prick the dough with a fork along both the bottom and the sides. Place ramekins on a rimmed cookie sheet and bake until they are lightly browned – approximately 12 minutes. Heat olive oil over medium heat. Add chopped onion, celery and garlic cloves to the Dutch oven. Stir frequently and cook until the veggies are lightly brown and tender about 8-10 minutes. Add mushrooms and frozen onions. Cook for about 4 minutes. Add the reserved broth and wine. Bring to a boil and scrape the browned bits from the bottom of the pan. Add potatoes, carrots, corn, and peas. Reduce heat and simmer for about 25 minutes or until potatoes and carrots are tender. You may need to add a little bit more chicken stock if it is low. Bring to a boil. Whisk together the flour and water. And stir 1/2 of the flour/water mixture into the boiling broth. Continue to add more until it becomes a thick sauce. Add cubed chicken and thyme. Unfold Puff Pastry and cut 4 circles that are 1 inch larger the rim of your ramekins. Spoon in about 3/4 cup of the savory filling or enough to fill the ramekins. 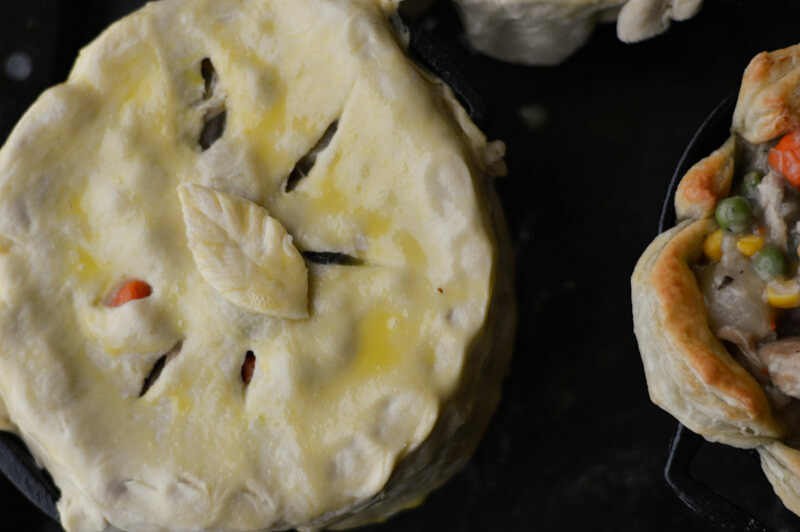 Lay the smaller Puff Pastry circle over the filling and gently crimp down onto the bottom crust. Cut a couple slits in the crust to let the steam out as it cooks. Brush the crust with egg wash and bake for 22-25 minutes until golden brown. Love your photos! 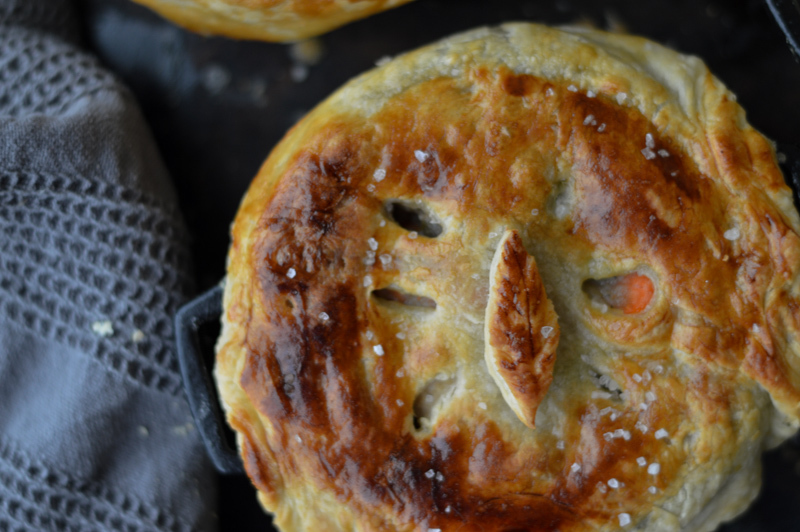 The Puff Pastry is a great idea for these pot pies – easy. The veggies and chicken in the wine sauce sounds amazing.